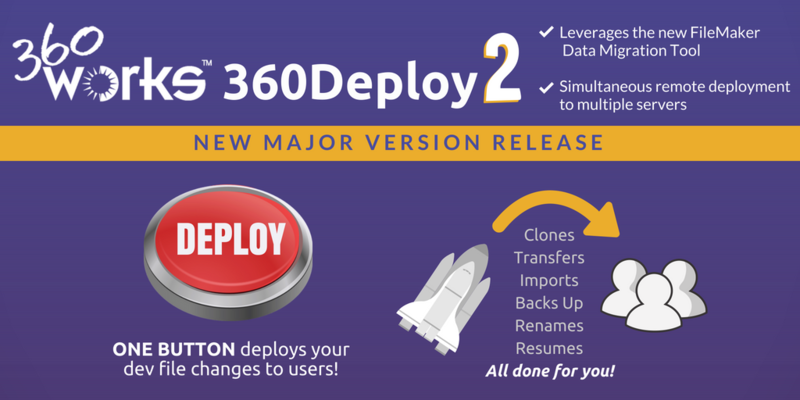 360Works is proud to announce the release of 360Deploy 2! 360Deploy is an easy-to-use developer tool that automates development changes from a development environment to the production server. With the click of a button, it handles all tedious data migration tasks. 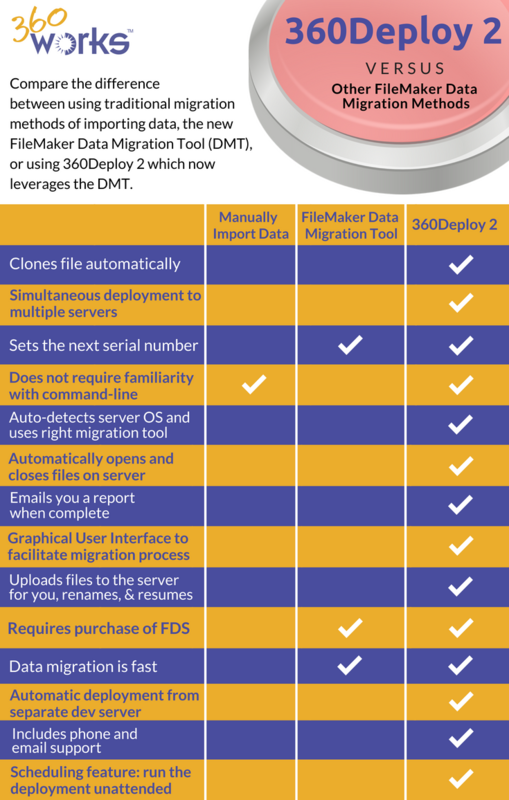 360Deploy 2 leverages the new FileMaker Data Migration Tool, making the import super fast! Vertical Market solution developers will especially benefit from 360Deploy 2, as it allows for simultaneous remote deployment to multiple servers. Developers with shrink-wrapped software can do a simultaneous version update to multiple client servers around the world...all with a single click. Once you press the 'deploy' button in 360Deploy, there is nothing left to do. It sends the new version to FileMaker Server (or multiple servers), and then runs in the background on each server, so you are free to continue working, take a break, or head home for the night, knowing that the new version will be safely deployed to users on each server by the time you get back. You'll receive an email when the process is complete. Skip the hassle of fumbling with files on the server and stick to the 'one-button click' of 360Deploy for dev changes!